STARDOM's Autonomous Controllers FCN and FCJ feature functions for transmitting field data as information over a network in addition to control functions. These controllers are provided with a web server function and an e-mail transmission function as the key means for transmitting this information. However, the actual transmission of the information has required Java, HTML and other programming skills up till now, and thus becoming a problem of increasing engineering costs. This paper introduces InfoWell, the information transmission package for STARDOM, which aims for the great reduction of these engineering costs by enabling the creation of web screens and the transmission of e-mail with less programming effort. This paper describes the concept behind the development of InfoWell, an outline of its configuration, its features and application examples. 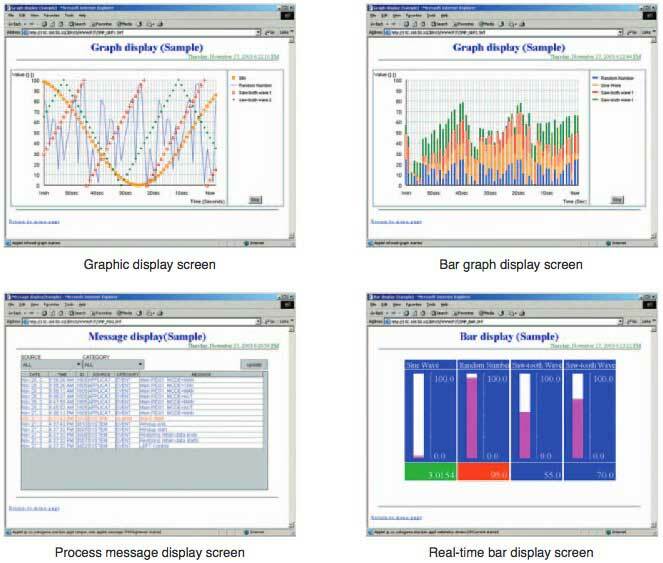 One solution packaged for production control systems today is a system comprising a PLC and SCADA (Supervisory Control and Data Acquisition) software that runs on a PC. An advantage of these systems is that they can be configured at considerably lower cost than systems that use dedicated devices as they use commercially available PCs. These systems are also very advantageous from an engineering point of view since a wide range of third-party PC software or advanced development environments can be utilized. However, it would be no exaggeration to say that a PC-SCADA-PLC combined system is a cost-priority solution that permits several disadvantages such as a complicated configuration due to the connection of multiple devices, weak PC environmental resistance, and a shorter service life. STARDOM's Autonomous Controllers FCN (Field Control Node) and FCJ (Field Control Junction) are the best solutions for these types of problems. 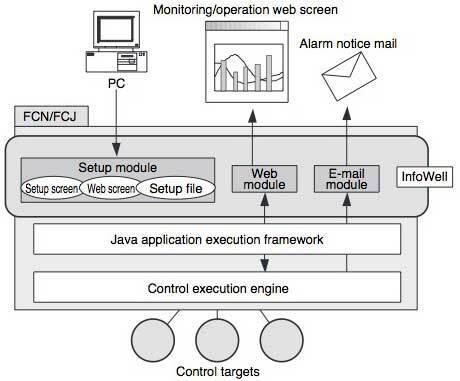 FCN and FCJ are equipped with the Java application execution environment JEROS2 in addition to an IEC61131-3 language-based control execution engine, and allow the disclosure of data over the Internet, e-mail transmission and FTP-based file transfer. Yet, in conventional development environments provided so far, specialist knowledge was required for Java programming or the creation of web screens in order to use these information transmission functions. The current circumstances in the area of control are that engineers have little Internet, e-mail or IT-related experience, or, vice versa, IT engineers have little know-how or experience in the area of control. As such, it has been impossible to avoid the problem of increased costs to achieve both of these objectives. To solve problems such as these, we have developed the "InfoWell" software package to enable simpler utilization of the information transmission functions of FCN and FCJ that allow control and information transmission on a single device. The InfoWell software package allows engineers to develop web or e-mail applications for execution on FCN and FCJ without the need for any IT-related programming knowledge. This software package is named with the intention that information (Info) will successfully flow out from a well (Well). An objective of InfoWell is programming-free engineering to keep engineering costs to a minimum. For this reason, InfoWell provides packaged software for achieving web and e-mail functions, and a setup module for easy utilization of this software. Rather than providing an extensive range of functions, the setup module provides a limited number of frequently used functions with the aim of making operation simpler and easier. The inclusion of a dedicated setup PC or a dedicated monitoring PC in conventional system configurations results in inferior maintainability as setup at installation is complicated and the system must be reset in the event of a malfunction. To avoid these problems, all of the setup tools and files required for operation of InfoWell are located in FCN and FCJ. This enables the configuration of thin clients on the PCs used for setup or monitoring, thus reducing operation and administration costs. Configuration of thin clients in this way is advantageous as setup, monitoring and operation is possible on any terminal connected to the network. With this release, two applications, one for web accessing and the other for e-mail, have been developed as the InfoWell software package. Logging and other high-demand applications are scheduled to be developed successively in the future. For this reason, InfoWell makes effective use of Yokogawa Electric's Java application execution framework mounted on FCN and FCJ, and adopts an architecture that is aware of the independency and expandability of each application. Figure 1 shows an example of a system configuration using InfoWell. 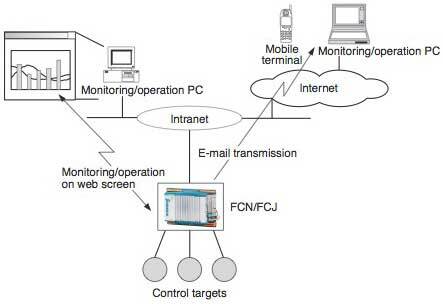 In this example, FCN and FCJ are located within the Intranet, and data acquired from control targets is transmitted as information to a monitoring/operation terminal using web screens and e-mail. Also, web screens can be operated to assign instructions to control targets. Figure 2 shows the software configuration of InfoWell. FCN and FCJ are mounted with a control execution engine, and control field devices, mechanical equipment and other hardware. The Java application execution framework functions independently of this control execution engine, and InfoWell is built on this framework. Located within InfoWell are a web module for executing the web application, an e-mail module for executing the e-mail application, and a setup module for setting operation of each of the web and e-mail modules. InfoWell's web module collaborates with the web server provided by the framework, and processes HTTP requests issued from the web screen. In web screens that comprise only HTML, SSI (Server Side Include) is used to imbed the control data in the web screen and display that data on client In web screens that graphically display control data, Java Applets are used to enable periodic display updating. Communications between each Applet and the FCN and FCJ web server is performed using simple RPC (Remote Procedure Call) protocol on HTTP. The e-mail module uses an SMTP (Simple Mail Transfer Protocol) client function provided by the framework for communications with the mail server. This module acquires data from the control execution engine, judges whether that data is an arithmetic operation or an alarm, and sends e-mail. InfoWell holds the operation setup information for the web and e-mail applications, and the web screens for disclosure of data internally on FCN and FCJ. The setup screens for creating this operation setup information and the web screens are configured in HTML and Java Applets, and are also held internally on FCN and FCJ. Setup is performed by calling up the screens held internally on FCN and FCJ from the web browser running on the PC. Display of created web screen for verification The above procedure allows web screens such as the sample screens in Figure 4 to be created. The control execution engine of FCN and FCJ supports both process control and sequence control. In process control, the control execution engine stores any changes in process status in memory as a message whenever they occur. The e-mail module can read the contents of memory, and send the process status as it is as mail. On the other hand, in sequence control, the control execution engine enables the engineer to define alarm conditions such as contact ON/OFF states or upper/lower limit values, and to define judgment conditions such as dead band or alarm hysteresis in detail. The e-mail module is also provided with e-mail messages for each alarm cause. Though FCN and FCJ are equipped with a control execution engine and information transmission functions in the same hardware, operation of these functions on each of FCN and FCJ can be modified independently. This feature has been utilized so that web screens and e-mail transmission setups can be modified on InfoWell according to the circumstances without control execution being suspended. Data writes to the control execution engine, a history of sent e-mail, and a file update history are saved to a log file. This ensures the traceability of modifications made to data setups. InfoWell is currently being applied to build in-plant electrical power monitoring systems. In these systems, several or several tens of electrical power monitors are connected to a single FCJ, and electrical power consumption is monitored on a web browser. InfoWell is used to create this web screen. As a result of using InfoWell, control targets can now be monitored from anywhere within the Intranet, and the number of man-hours required for development can be considerably reduced. At the production site, there is a need to grasp facilities maintenance-related information such as device operating rates, lot production completion pre-alarms, and consumable replacement timing in addition to originally intended operation. In the case of facilities not requiring SCADA software, or if a screen for facilities maintenance is also required in addition to an operation screen even when SCADA software is in use, InfoWell allows the above-mentioned maintenance information to be transmitted with ease. In addition to FCN and FCJ's features of excellent environmental resistance and prolonged stable operation, InfoWell enables the use of information transmission functions while suppressing engineering costs at the same time. We have not limited InfoWell's applications to web access and e-mail; we have increased its scope to include data logging applications, for example; and hope to develop InfoWell with a view to further integrating control and information. STARDOM is a trademark of Yokogawa Electric Corporation.